A bit of fun this one. Professional corner weights are about £800 so can you spend 1/10th of that and use bathroom scales? Here's my video. If you are like me and obsess about car stats such as power to weight ratios or if you’ve removed or replaced parts on your car then you’ll want to know how much your car actually weighs. The cheapest corner weigh system I could find was just under £800. Bathroom scales are about £10 each so I wondered if I could use theses instead? My car’s handbook says the car weighs on average 1375 kg. Bathroom scales can weigh up to 180 kg each so 1375 divided by 180 is roughly 8. Surely putting two under each wheel would give close to the correct weight? I went to my local supermarket and bought 10 scales to find out. •	Wood at least 50mm thick. 1. Take a note of how much fuel is in the car. Here you can see I’ve about a quarter tank. You’ll need this to work out the final weight of the car. 2. Remove anything you are not going to keep in the car. Here I’ve removed the spare wheel toolkit and cd player. 3. I picked up two 2.4 metre “2x5”s from a local hardware store. These measure 47mil x 125mil. I made one cut at 900 mil on each piece of wood to give me four pieces: two of 900 mil and two of 1500 mil. 4. Next you’ll need to lift one corner of your car. Please click the screen now refer to my lifting guide if you’ve not sure about this. 5. Make sure the handbrake is on and lift the passenger side front wheel first. 6. Place two scales under the wheel then place a piece of wood on top. 7. Slowly lower the wheel onto the wood. 8. 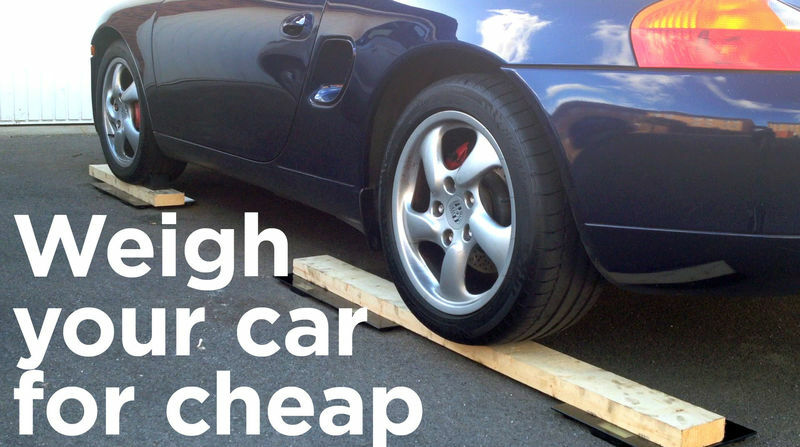 Place a chock in front of the wheel to stop the car rolling forward when you lift the rear. 9. Repeat for the remaining wheels. 10. If your car is light enough in theory that should be it. In reality the rear of my Boxster is much heavier than the front (due to the engine being there) and would error the scales. 11. To fix this I used 3 scales each on the rear wheels. You have to experiment with the scale’s position as you need to spread the load evenly over them. 12. Once you have all 4 wheels on scales and each scale giving you a reading remove the chocks and simply write down the reading on each. You will have to give each scale a nudge to get them to display the reading. 13. So here are the results for my Boxster. 15. Let’s talk about the weight of the fuel. From my research petrol weighs 0.74 kilos a litre. My car has a 64 litre tank so a quarter of that is 16 so the fuel in the car weighs roughly 8 kilos. 16. So at 1366 kg that almost in the middle of the weight range for this car given by the handbook so whilst the bathroom scales may not be absolutely accurate they are in the ballpark. I’ll try to get the car on professional scales and see how accurate this in in the future. 18. Final power to weight stats for all those interested. You’ll notice that removing the 17 kilos of weight from the car is the equivalent of an extra 2 bhp per tonne. Or, you can just go to any local truck stop, quarry, large landscape place or recycling center that has a scale and drive over it. They will tell you the weight. At least here in the USA. I've gotten basically free corner weights before myself at the larger national-level autocross events where some classes have minimum weights (they will typically have scales set up at such events for the minimum-weight classed cars to drive up to for policing the rules compliance at such events - however, I've found the scales are available for use by other competitors when not needed by the minimum-weight classed cars. If you asked nicely, and catch them when they're not busy, the folks running the scales could probably even accommodate weighing a car that's not entered in the event. However, the scales set up at such events typically wouldn't be an flat-calibrated surfaces, like you'd find at a race car prep shop. But Jcscocum also makes a good point that for just for general overall car weighing duty, there are many other options which would be easy and convenient (at least in the US). Last edited by jakeru; 04-13-2016 at 09:08 PM. So there will be a lot of 10 bathroom scale sets in near future on ebay and craigslist? Honey, do these wheels make me look fat? Cool system. One question I would have is if a quarter tank on the fuel gauge is actually a true quarter tank. On most cars I have noticed the needle moves more quickly once below the half tank mark. I usually get about 150 mile from full to the half tank mark, and another 50 miles gets me to the quarter tank mark. I have never let it get emptier, but I would bet it's only 80 miles from half a tank to empty. If you're ever bored try it with a full tank and see what the results are. Last edited by Roger1965; 06-11-2016 at 12:59 PM.